Sometimes your worst enemies turn out to be your best friends. Chef-owner Jesus Nunez should have no remorse over the lawsuit from another NYC restaurateur that forced him to change the name from Graffit — no “i” — to Gastroarte. Both are allusions to something visual and perhaps playful, but the latter turns out to be the most accurate moniker. That’s because the food is as beautiful as it is inventive. And because this is The Restaurant Dieter, you need to know that it’s only moderately low fat and healthy. I say moderately because while Nunez makes few concessions in the olive oil department, his well prepared dishes are modest in portion. As part of a dieter’s restrained day, Gastroarte is doable and quite enjoyable. The restaurant has an array of tapas and small plates available in the front of the house at the bar. In the back there is a stripped down menu — just 15 items, including six entrees, three fish and three meat. 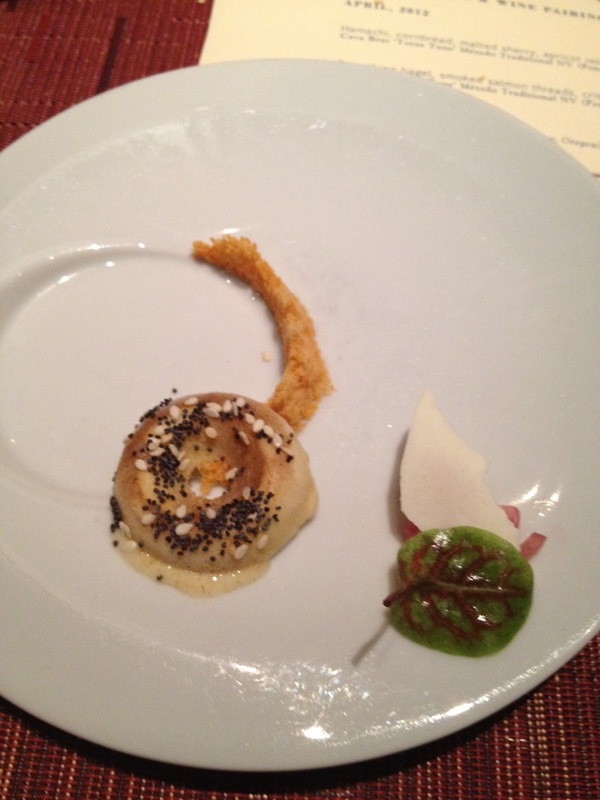 Dinner began with an amuse bouche consisting of two parts. 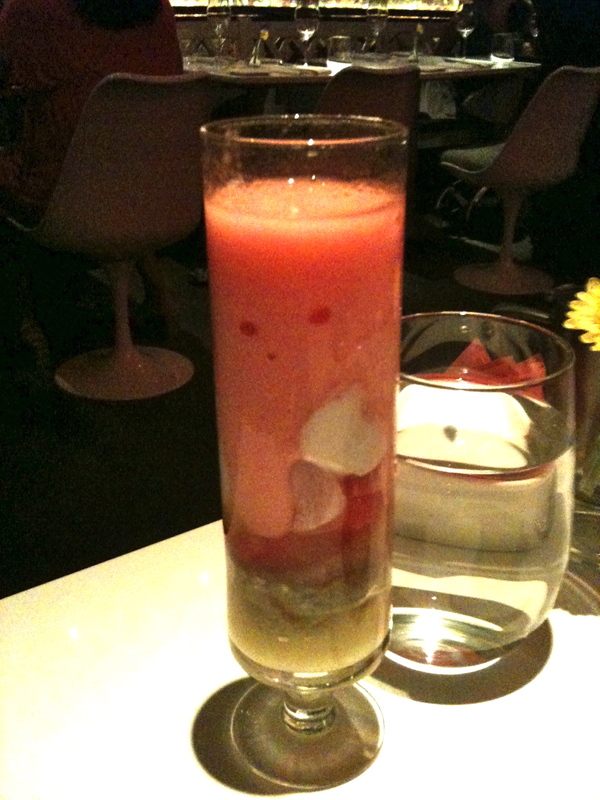 A small glass held three layers, apples and pears, a blood orange granita and sangria foam. It was excellent if a tad too sweet as an amuse bouche. 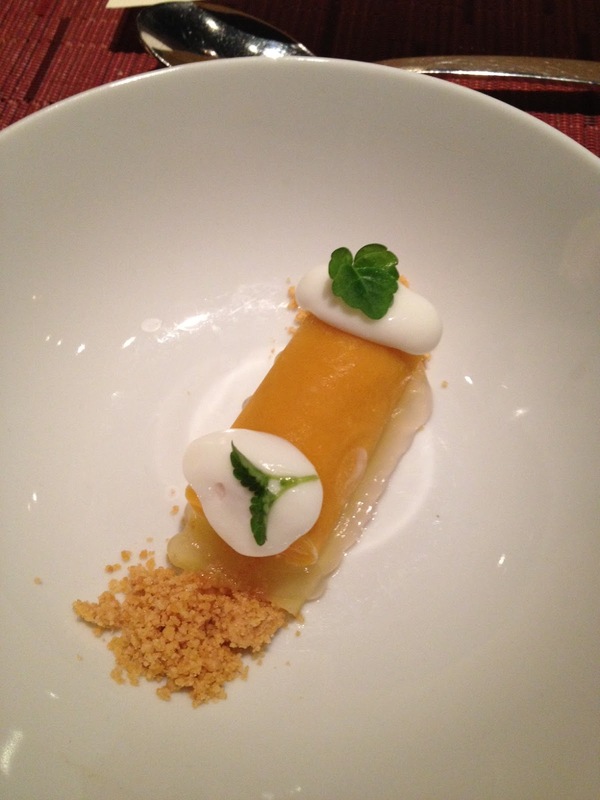 The second part was a rectangle of kohlrabi the size of a postage stamp, topped with a lime gelee and arugula micro greens. What an inventive little bite. 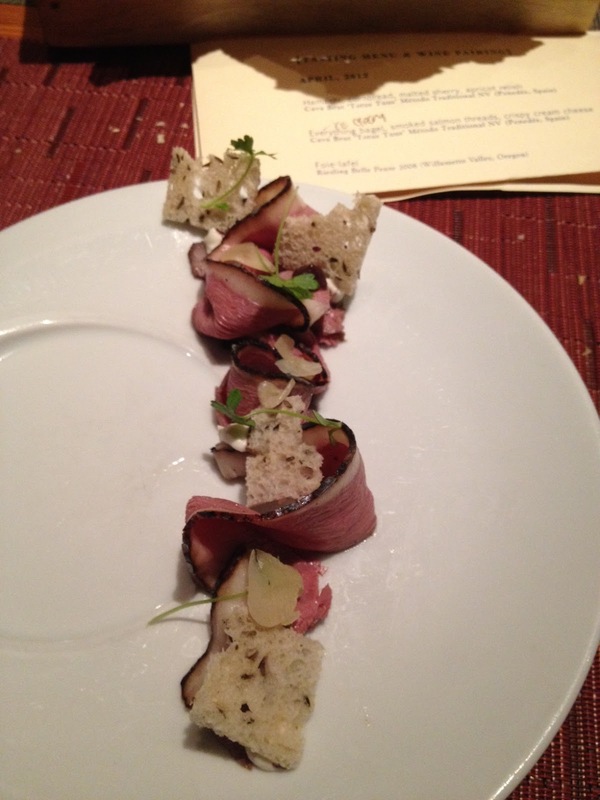 It was the second time recently when kohlrabi has been featured in a high-end dish. Kohlrabi seems an emerging restaurant trend. The appetizer selection was my own missed opportunity. 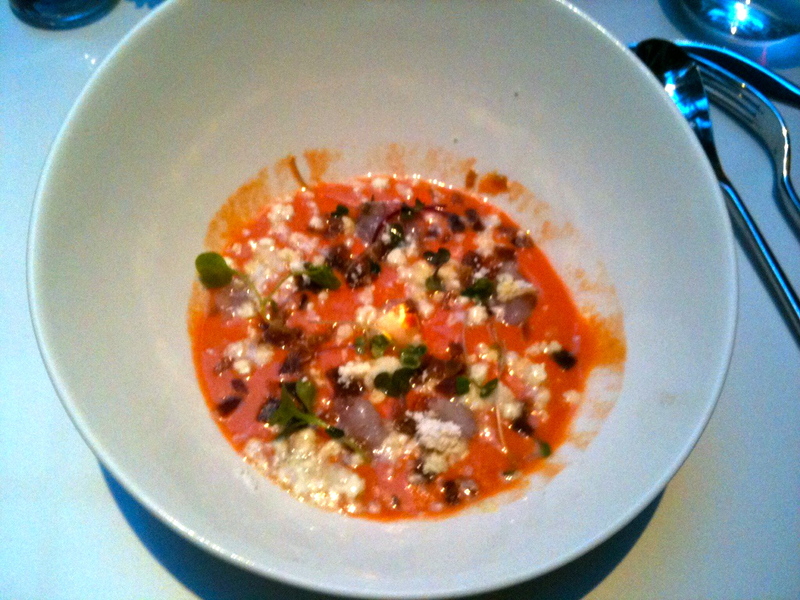 Not wanting another green salad or beet salad with goat cheese, I opted for a soup the server described as “like a gazpacho” with salt-cured-rock shrimp. Had I studied the menu more closely or asked questions better, I might have focused on those other two ingredients — boiled egg and Serrano ham. What arrived was a velvety soup the color of a rosy peach, finished with bits of white that the server said were olive oil powder. It was beautiful to look at and wonderfully rich, likely thanks to the olive oil powder, boiled egg and Serrano ham. Not the hoped-for low fat gazpacho, but heavenly. One wishes the server, asked about low fat offerings, had suggested the gazpacho off the tapas menu, which featured fresh and picked cucumber and salmon roe. It sounded healthier. The wisest choice of all might have been that green salad, for The Restaurant Dieter’s spouse had a pile of fresh greens, sitting atop carpachio-sliced pear with quince and walnuts in a light balsamic dressing. A taste offered by TRD Spouse inspired intense buyer’s remorse. 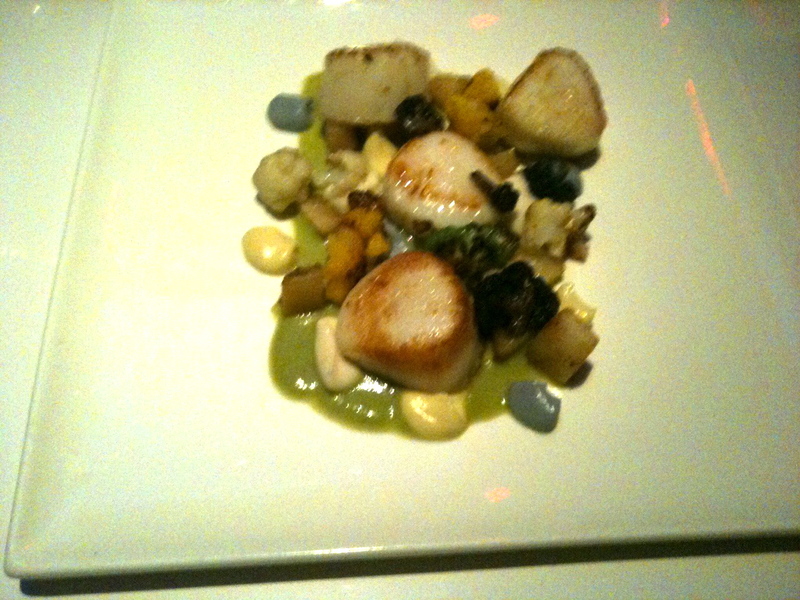 The recommended low-fat main was pan-seared scallops with pear and cauliflower. It was an artful mosaic of discs and dollops: thumbnail-sized cauliflower florets of white and green, cauliflower puree in yellow, green and lavender, diced bits of pear and perfectly cooked oblong scallops. It had the sheen that suggested no fat was spared in its preparation. 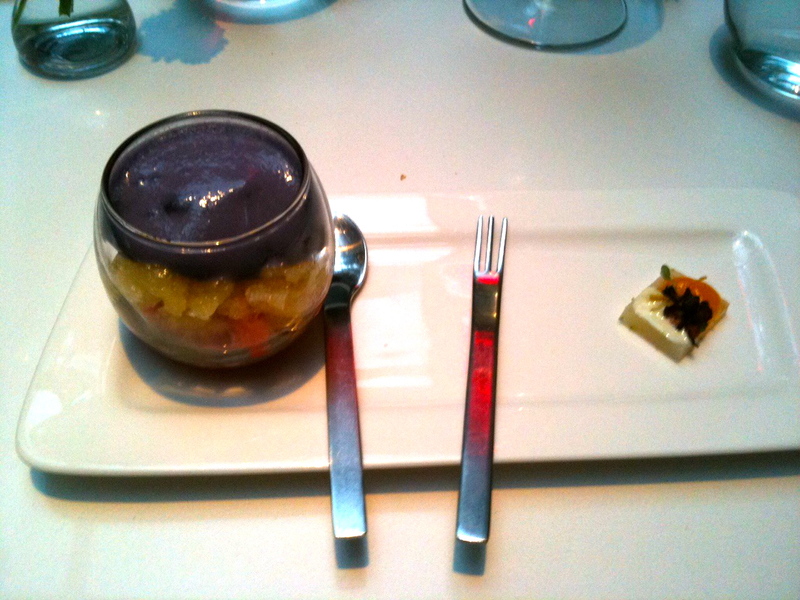 Dessert offered a fresh fruit option, which is never refused. A champagne flute was layered with small chunks of fresh watermelon, a lime glee, dollops of coconut cream and topped with a strawberry foam. With the exception of the rich coconut, it was fairly light. TRD Spouse enjoyed Gastroarte at its zenith. 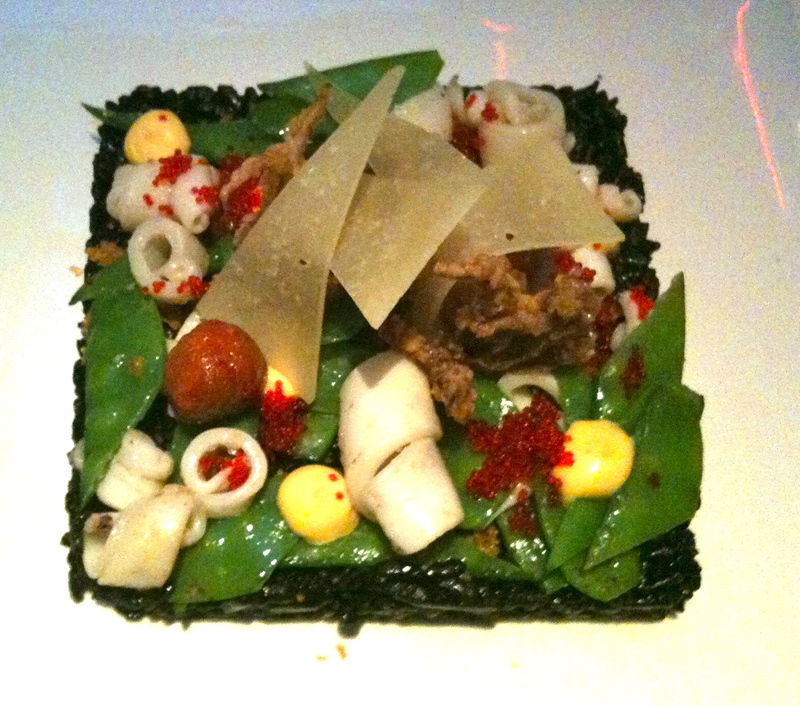 His black rice with calamari arrived in a perfect rectangle, looking like a Thumbelina-sized garden with a colorful array of plantings. 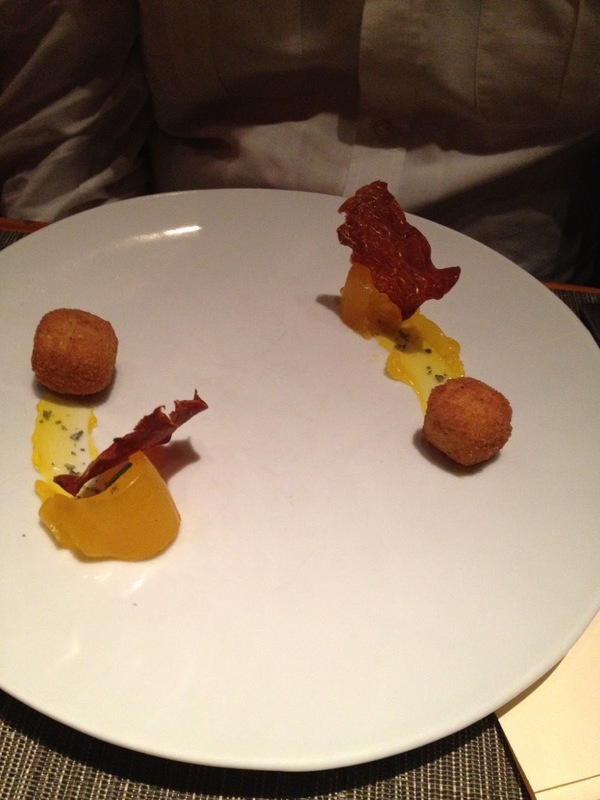 His dessert was a swirling universe of orange and blood orange sauce, on which a group of fried chocolate ball planets orbited. The latter was consumed so quickly I never got a photograph. Welcome to the newly christened Gastroarte, where the food may not be low in calories, but it certainly is beautiful to look at.